Does your job have you stressed out? Is your better half (husband or wife) on your case? Are you bummed out about the "Dawgs"? - let's not go there. Does all this make you feel like "tying 1 on"? That's what we'll be doing Tuesday, November 3, at Unicoi Outfitters in Helen. 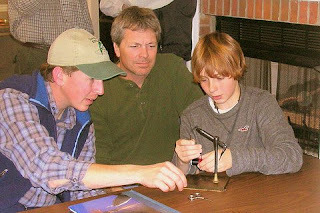 Come join us at 6:30 PM for our monthly fly tying session - everyone is welcome. If you're just wanting to learn to tie flies or you already tie, you're invited. Bring equipment if you have it - if not, we'll supply it. We have a pretty good time at each session and occasionally we even tie a fly that might catch a fish. Hope to see you Tuesday.